Are you passionate about yoga and ready to take the step toward further personal transformation? Is it your dream to make a living by doing what you love? Would you like to deeply understand the teachings and practices of the ancient traditions of yoga or become more specialised than you already are? Then the certified Yoga Teacher Training at Kawai Purapura is for you. The 200 hour YTTC qualification is one of the most flexible on offer, designed to fit around your busy schedules. You can choose whether to complete the course in one intensive 18 day block (January), two lots of 9 day blocks (August and September), or over 9 weekends between May and September. 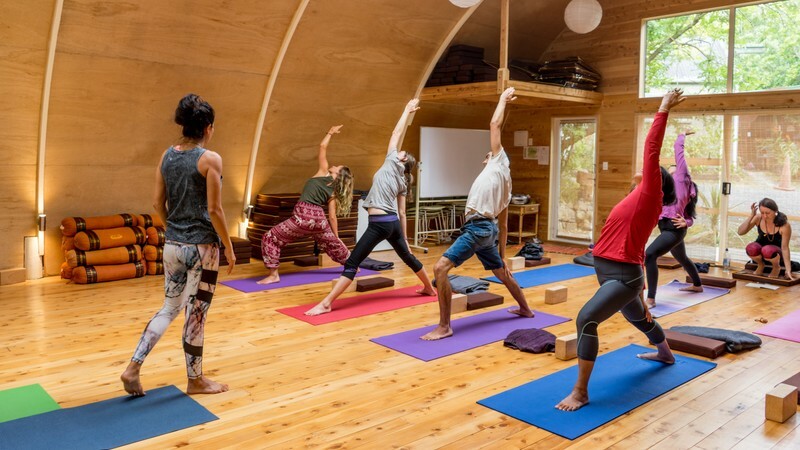 The 200 Hour Yoga Teacher Training at Kawai Purapura is dedicated to helping you establish a solid foundation to becoming an inspiring and skilled teacher. It trains you in the ancient and traditional approach to yoga practice and extends your journey into the modern evolutionary pathways of yoga, exploring the richness of the relationship between body, mind and movement. You will gain enough in-depth knowledge and understanding of each of the eight limbs of yoga to be able to connect with the origin of yoga and the teacher within. On the course, there will be a lot of opportunity to refine your practice, deepen your knowledge of many aspects of yoga, learn about anatomy and physiology and how yoga benefits the body and mind. You will gain the essential teaching skills necessary to confidently lead group sessions and also learn about the business aspect of yoga, along with the skills required to create a sustainable practice. The Yoga Teacher Training at Kawai Purapura is certified with Yoga Alliance US. Graduates of the training can apply for international accreditation through Yoga Alliance US, becoming either a RYT200 or a RYT500, depending on the level of training completed. For any questions about our trainings, please contact our Course Coordinator on yogaeducation@kawaipurapura.co.nz.